You must make reservations at least 5 minutes in advance of the time at The Den On Sunset. The Den On Sunset is a neighborhood restaurant bar that offers delicious comfort food in a cozy environment right on the Sunset Strip. Join us for romantic evening at a tucked away table or gather on the patio with a large group. Our newly remodeled space has something for everyone. Join us for your favorite patio vibes on Cinco de Mayo! Drink specials all day / night. Enjoy some patio time with mom. Book with us and receive a complimentary a glass of sparkling for each person over 21. Enjoy some patio time with dad. Book with us and receive a complimentary a glass of sparkling for each person over 21. The Den can get chaotic, but ultimately the Sunset Strip bar is a good time. Always enjoy the space. Great deals, easy parking situation and the food was really good. It’s very dark on the inside but otherwise a great place! Very convenient for the Comedy Store! Bar food and drinks are on point. It’s a cool bar, popping on Fridays and Saturdays. I recommmend their bacon wrapped dates. Out this world. Steak frites was also perfectly cooked (I asked for medium). Yelp actually was on point with this place. Hockey was playing and I couldn’t have ben happier! Great ambiance, loved the indoor to outdoor seating and fireplace. The lighting was so soft and it wasn’t loud because our reservation was for 5:30pm on a Tuesday night. Will definitely bring the boyfriend and other friends to enjoy! This place has charm and ambiance, but could use a little more finesse. We were told ahead of time that food would come out at random times, and boy did it ever. Makes for an awkward eating experience. They had been open for 39 minutes and were somehow out of biscuits. Those are like four ingredients that all kitchens have! It was an average brunch experience overall. I wouldn’t not recommend it, it I wouldn’t tell people to go out of their way to try it. Would not recommend the brunch to friends. 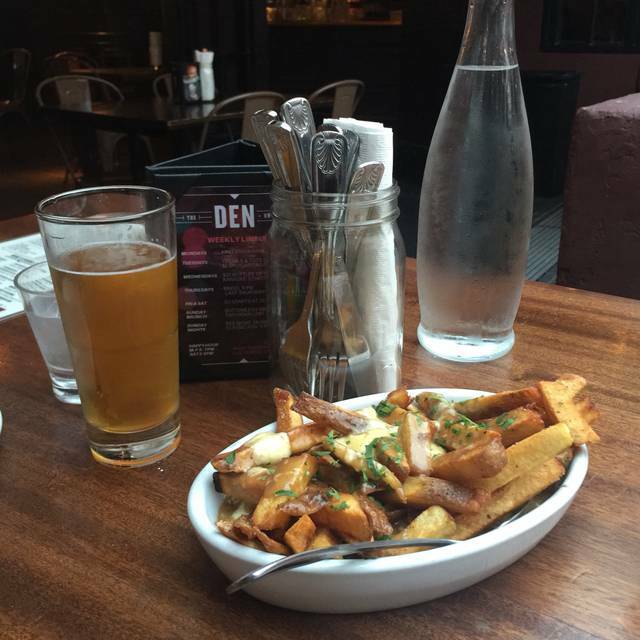 The Den on Sunset is better for bar food and snacks. Fun, lively place for a group brunch. Great atmosphere for the Rams game too. Food and service was fantastic even though it was slammed. Great place for groups to come. Great staff, great food, professional service. Absolutely LOVED The Den. I was hosting a group of 11 and was worried about finding a place that could accommodate us, but the Den Staff were fantastic and so helpful. Food and drinks were great and the ambiance was fantastic. Would recommend it to anyone! Ambience and music is good. However i did not find it very special with food and drinks. The quantity of a glass of a drink or food plate served were not value for money. Highly priced as compared to what came in order. Favorite neighborhood spot!! Drag bingo on the last Thursday of the month and it does not disappoint!! Amazing food. Friendly attentive staff. Lovely atmosphere. The hostess was extremely rude. Was not welcoming. We sat in a super cute booth space that was tucked into the wall. Service was a bit slow and the waitress forgot to put in our app but when she did it came out quick. This is a neighborhood spot for us and we absolutely love it! Buffalo cauliflower wings are amazing as are the cocktails! The appetizers were delicious. Brussels sprouts and buffalo cauliflower was so good we reordered both. Outdoor patio was perfect except for smoking. Great service - waitress was EXCELLENT. Great tunes. Really good food, excellent brews. Will return. They allow smoking on the patio. We moved inside. Someone was smoking like a chimney outside. Food and service was good. Food was delicious, service excellent. Good value for the money. It was loud when we were there--because the World Cup was on the big screen. But it wasn't too loud to keep us from having a good time. We had so much fun at Bingo night! Our server was super nice and the other staff helped out and asked how we were doing as well. The food was on point. Everyone at my table likes what they ordered. The veggie burger was eclectic and I liked it just how it came. Patty wasn’t mushy at all and seemed homemade. Little bit pricey, but worth it for the ambience and it is West Hollywood after all. The Den is a wonderful restaurant/bar hidden off the streets of Sunset. I recommend getting the Bacon-wrapped Dates and a Veggie Flatbread. The flatbreads are truly the best deal here! Not what I expected but a great experience all the same. In fact I was so delightfully surprised. For a bar the food was good, atmosphere was lively and yet you could still comfortably hear one another. I would absolutely love to go back. Came here for Mother's Day brunch. Definitely not the typical place for it, but we really enjoyed. Cool ambiance, good food, good service. They gave us free champagne and a free dessert for booking on Mother's Day, which we all enjoyed. It also looks like it would be a good place to come for happy hour or for trivia. The Den might be one of the last places in LA that allows smoking where people are eating. Imagine our chagrin when we were seated and immediately started smelling smoke being blown in our faces. NO THANK YOU! This is a bar with food. It should not be listed as a restaurant. My new favorite spot to grab food or drinks before the comedy shows up the street! We enjoyed everything about The Den--especially the service, which was attentive and friendly. The piped-in music was a bit loud, but that might be because we were conducting business for part of the meal. But we most certainly will return. The best place for a great night with friends and amazing food! And the manager is amazing and super helpful! Check it out! Hard to find parking depending on the time of day you go, and the valet is $12. We were told it was happy hour when we arrived. They seated us and forgot we were there until about 15 minutes later when we asked to be served. We ordered our food and drinks, then they came back to inform us it wasn’t happy hour. They still gave us $2 off each of our 2 drinks, but didn’t give us the happy hour price of the food we ordered. The food was pretty good, but kinda small portions. We had a great time at this low key restaurant. We asked to be seating inside, far from smokers, and they were happy to accommodate. My vegan daughter was as satisfied as my paleo self. And the servers were lovely! This place was good. The food, service, and ambiance were nice. The only downside is that the inside was open to outdoors where people were smoking and it was coming inside. That was really unappealing as I don't like cigarette smoking around my food. Serving was a little slow but staff was super friendly. Fun night celebrating a friends birthday. We also grabbed some food, Yummy, especially the brussel sprouts (yes, I said brussel sprouts, ha).